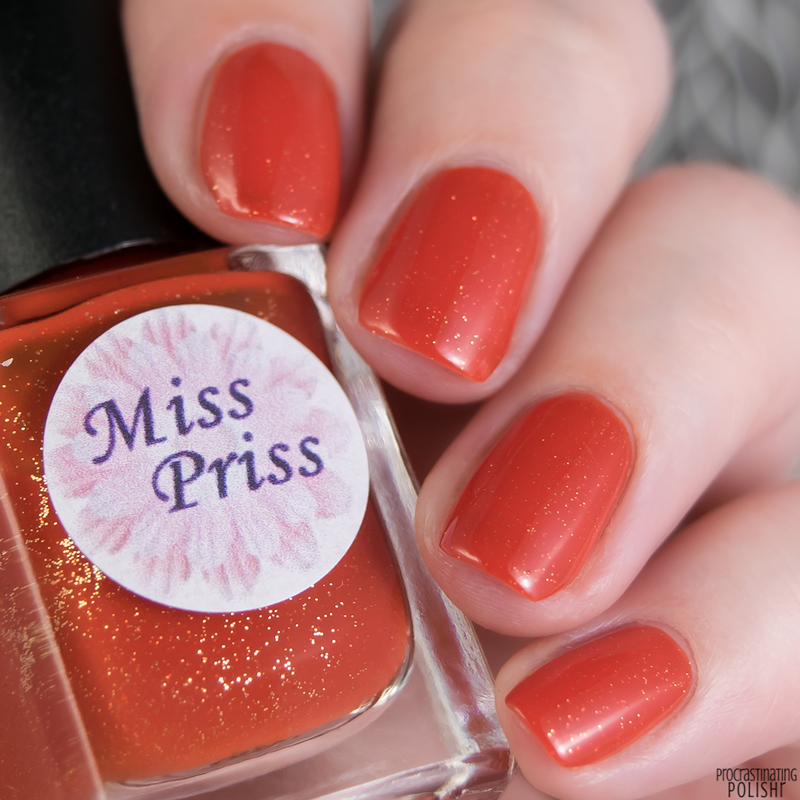 Time to visit the seven wonders of the natural world today, with a beautiful collection from a new to me brand, Miss Priss Polish. 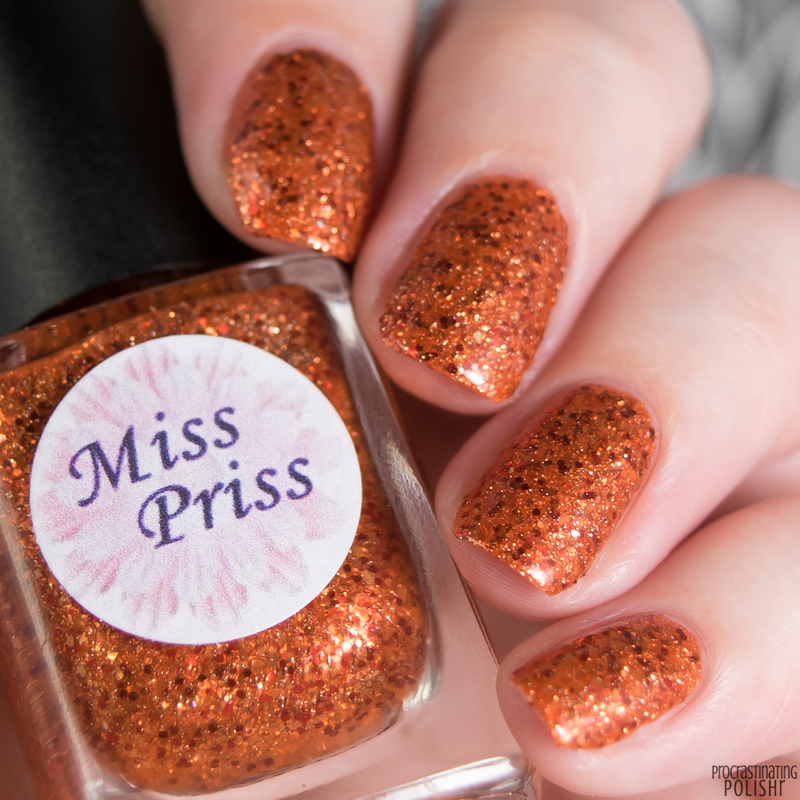 I'm quite late to the party with Miss Priss - they've been around for a couple years now but this collection (ok, and a few I picked up at Aussie Indie Con in June) was my first proper introduction to the brand. Let's take a look at how the spectacular inspirations look in nail polish form! 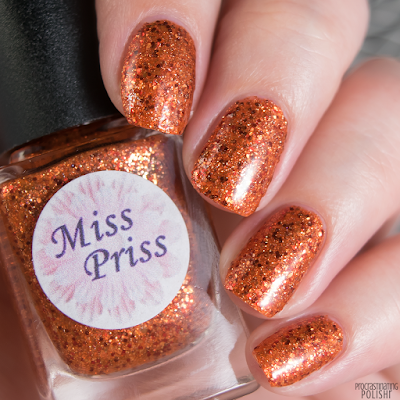 Bright orangey-red crelly with gold micro glitter. Inspired by Parícutin, a volcano that formed in a corn field in Mexico in the early 1940s and was active for 9 years. It is notable for being the only volcano that scientists have ever been able to observe from birth to extinction. This had a nice formula, smooth and easy to apply. The finish is quite smooth considering the glitter - which is very well behaved and doesn't cause any dragging or balding as glitter sometimes will do. I needed three coats for opacity - there looks to be a little VNL in my pictures but I didn't notice it in real life. Swatch is with a thick fast dry top coat. A soft aqua crelly with a delicate silvery holo shimmer. This one is inspired by Victoria Falls, the largest waterfall in the world. I like the subtle holo shimmer against the aqua base, it complements the colour really beautifully. This one also had a nice formula, it's thin but not runny so it's easy to apply in nice thin coats. It self levels nicely too. It's a little on the sheer side - my swatch is three thin coats, but I think perhaps I'd have preferred another. Swatch is with fast dry top coat. Blackened blue/teal holo with multichrome flakes and purple microglitter. Inspired by the Aurora Borealis, also known as the Northern Lights. The holo is much more prominent in daylight/direct light than my photos show, and it's the holo sparkle that really gives it more of an aurora feel. I would have liked some more green in there though, as I always imagine green glowing lights when I think of an aurora. The formula of this one was a little tricky - the base is a bit sticky which made application difficult. I ended up using thicker coats to avoid dragging, but I'll be adding some thinner to my bottle before I use it again. I believe there has been an adjustment to the formula since I swatched though so you may not have any issues at all! I used a good thick top coat for my swatch as it's a bit of a thirsty one. Dark peacock blue holo with copper flakes, inspired by Guanabara Bay aka the Harbour of Rio de Janeiro. Guanabara Bay is the largest deep water bay in the world, and is surrounded by granite monolith mountains - it sounds spectacular! *adds to bucket list* I adore this colour! The base is so rich and such a gorgeous colour and of course I love the copper flakes! This has a lovely formula, perfect consistency for nice thin coats. It's nicely pigmented too - I used three thin coats for my swatch with super opaque results. To ensure a super smooth finish I used a thick fast dry top coat. A white/grey crelly with two sizes of silver holo glitter. Inspired by the towering Mount Everest, probably the most well known of the natural wonders. The polish is soft and ethereal, definitely evocative of being atop the worlds highest peak surrounded by ice and snow. The formula is nice, the glitter is easily managed and it applies quite nicely. I did three coats for my swatch and it's maybe a shade on the sheer side but I really liked it that way. It does dry with a bit of texture, so you'll need a good thick top coat or two coats of top coat. I used Pretty Serious Plump Up The Volume for my swatch. Bright ocean blue filled to the brim with blue and green glitters in a range of sizes. Inspired by our own natural wonder, the largest living thing on earth, the Great Barrier Reef! I've been lucky to see some of this natural wonder and it really is spectacular. 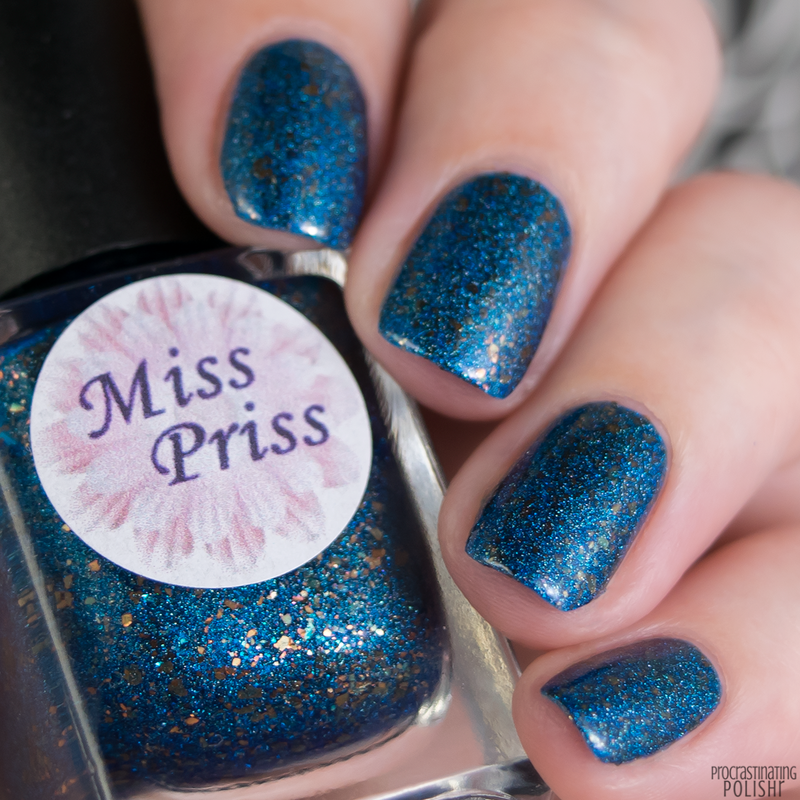 In polish form it's gorgeously sparkly and the most beautiful vivid blue. I was surprised how nice this was to work with given the amount of glitter in the bottle - it's smooth and easy to apply and quite opaque. I did two medium coats for my swatch and used a thick fast dry top coat. The only issue I found was that it's got a very strong smell - some blues tend to have a distinctive stink to them and this seems to be one of them. It shouldn't linger once the polish is dry though. Fiery orange glitter bomb, full of orange, red and gold glitters and copper flakes. Inspired by The Grand Canyon, another one of the more well known wonders. I like the bit of a burnt edge the red glitters give this though I found it wasn't super flattering with my skintone. It should make a great polish for Halloween though! This was another polish that had a bit of a sticky formula, similar to Dancing Sky. I did two thicker coats to ensure the glitters didn't drag and I was impressed with how opaque it was after two coats. It needed a good thick top coat to smooth out the texture of the glitters, I used Pretty Serious Plump Up The Volume but you could also do two coats of your normal top coat. 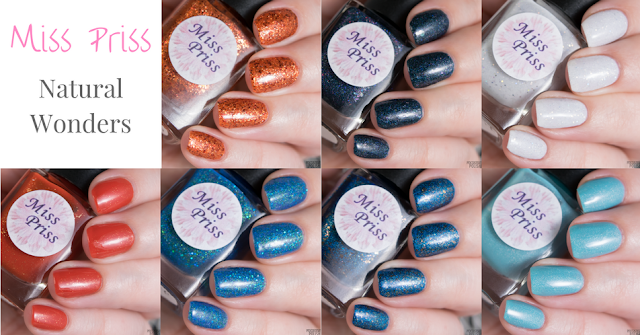 The Natural Wonders Collection is available from Miss Priss Polish right now! 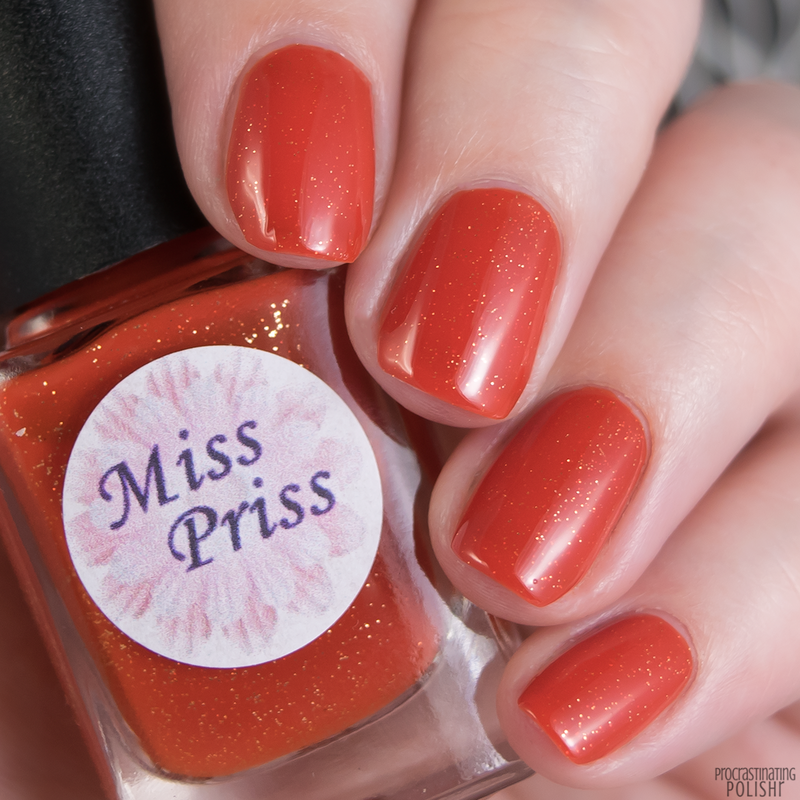 All Miss Priss polish is 5-free and handmade in Australia.